He was the only male member of the musical quartet known as Kush who stole the hearts of many Nigerians with the hit songs Lets Live Together. Dapo Torimo, multi-talented music producer and song writer is now the toast of American music stars including John Legend, Brandy and David Archuleta among others. Recently Torimiro worked with two-time Grammy winning producer, Jeffery Weber to record a song for the Obama Campaign called Change. The song is one of the high budget media stunts recorded during the campaign trail and aired on prime time Radio and TV. The musician who now wears a dreadlock has worked both in the studio and on tour with several American music greats such as ex-refugee artiste, Lauryn Hill, as well as Oscar Brown Jnr., and Lalah Hathaway. In October, he finished producing new songs for John legend, Brandy and David Archuleta. John legend, a five time Grammy Award winner has his latest song entitled Quickly produced by this versatile Nigerian singer. The single which has been earning rave reviews on musical charts is on the album Evolver which is John Legend's third studio album hit street on last October 28. 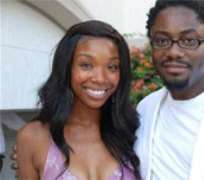 The album features multi-platinum-selling artiste Brandy. Quickly which was produced by Torimiro has received early industry buzz as an inspired, sleek duet featuring R&B/ pop music's leading artistes. An excited Torimiro told fans on his website, “it is a great opportunity and dream come true to be able to make the transition from being a travelling and studio musician to becoming a songwriter and producer for artistes who I have always been a fan of. It's great to go from being a fan to becoming a collaborator”. Another track entitled Running on David Archuleta's recently released debut was also produced by Torimiro. Archuleta who emerged runner-up on American Idol Show in June is making his debut as a musician after his success at the talent show. Another equally scintillating number entitled Torn Down from Brandy's highly anticipated album entitled Human, which was also produced by Torimiro is due for release on December 9. In the past couple of months, especially since June, global entertainment industry has been abuzz with the exploits of the Nigerian as news about his work inundates websites of top entertainment media outlets. “A Yamaha – corporation endorsed artiste, Torimiro has been recognized by many as a talented multi-instrumentalist and musical catalyst and he was previously sought- after by the industry top notch artistes to exhibit his skills as a touring and studio musician as well as to score various television and film project” noted one of such bulletins about Torimiro on the Internet. Bruce Waynne of Midi Mafia, an award winning production duo based in Los Angeles (US) says of Torimoro “ He brings something different to the table. You have to do something very special and unique for us to decide to work with you.” He explain further, “He plays multiple instruments, and he is not just a beat guy. He is someone who can also starts from scratch, but he does it his own way, from his own perspective, He brings a lot of musicality and a lot of theory to the mix. You are going to be seeing a lot of us working with him”. Currently, Dapo lives and works in Los Angeles, California. He continues to produce and write for artists and film projects. He is also working on his debut solo album, which has already drawn comparisons to the music of Sting and Seal. Occasionally, he might be spotted knocking out a killer solo, performing at jazz clubs or on tour with established artiste.